MSBA 2018 Day 41 - What's in a Name? 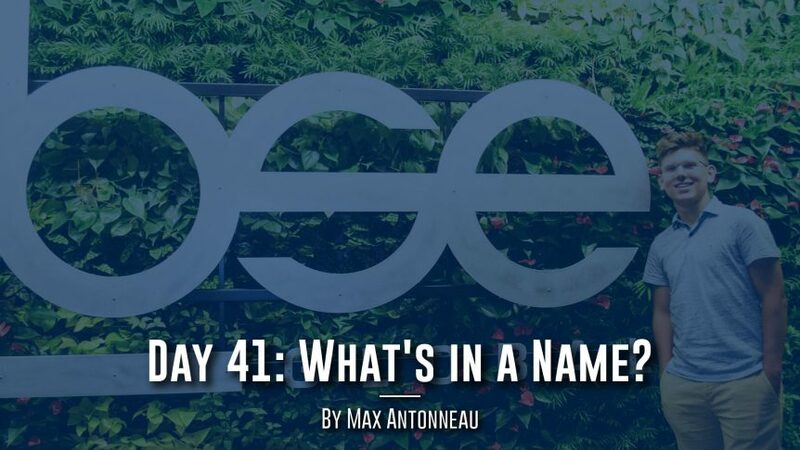 Day 41: What’s in a Name? When you last heard from me, I was raving about my experience at the NBA Draft. Today, I’ve got an even better story for you. On Monday, July 16th, after a regular work day at You First, I left the office en route to the Barclays Center. I had been tasked with delivering concert tickets to Andray Blatche, one of our clients. After the exchange, Andray, realizing my swagger (or the high number of leftover tickets he had), asked me to join him and his crew in a suite for Chris Brown. Both of these bizarre experiences of mine took place at the Barclays Center. Needless to say, I wasn’t a hard sell for BSE Global. BSE owns practically all sports and entertainment properties in Brooklyn. I suppose that’s why they’re called BSE (which once stood for “Brooklyn Sports & Entertainment”) Global. Managing the Brooklyn Nets franchise (and their G-League affiliate), business operations for the New York Islanders, and all entertainment within the Barclays Center, BSE Global provided MSBA with an all-encompassing display of the sports industry. Sales, event management, sponsorships, public relations, and analytics were the concentrations of the panelists and the primary functions of BSE Global. Upon seeing how each segment is integrated and accounted for, it became clear why BSE conducts such great events and has such successful business operations. On the basketball side of things, the Nets’ young core and search for an identity make it surprisingly easy to forget the distinctiveness of the franchise, which is all tied back to Brooklyn. VP of Global Partnerships Dan Gaiman referred to the Nets as a major player in 2019 free agency. My initial reaction was total disbelief, but it’s pretty funny what cap space and New York City can do for a team. Brooklyn itself sold Infor on becoming the Nets’ jersey patch sponsor, and don’t be surprised if Brooklyn itself sells Kyrie Irving, Jimmy Butler, Kawhi Leonard, or all three of them. If the gap narrows between the Eastern and Western Conferences of the NBA, it’s going to be because of Kristaps Porzingis and the Brooklyn Nets. And the Milwaukee Bucks. To my roommates Joe Buonadonna and Matt Schasel, thank you for somehow making every night spent in our dorm room a wild adventure. Just not to Washington, D.C.
To the other 24 of you, thank you for showing me 24 different ways to make it here, for giving me a priceless, timeless network, and for the best summer of my life. To Lorne Segall, thank you for your honesty, for being my fourth mentor, and for being a father of 27 for the last eight weeks. To Bailey Weigel, thank you for having patience with me, for being my caddie, and for being a mother of 27 for the last eight weeks. To David Oestreicher, thank you for bringing us together this summer and for keeping us together forever. To my parents, thank you for believing in me.